There's no better feeling that getting your hands on an early build of a game few people have played, and Gearbox Software is looking to give a few lucky individuals in the Plano, Texas area just that chance. Gearbox Software, developer of the award-winning Brothers in Arms series, is looking for many focus testers to give us their feedback on an exciting upcoming Gearbox title. Gearbox has currently announced Borderlands, a co-op sci-fi shooter, and Aliens: Colonial Marines, based on the influential Aliens movies. We’re looking for people able to visit our offices in Plano, Texas for a few hours to help us hone our games’ appeal. 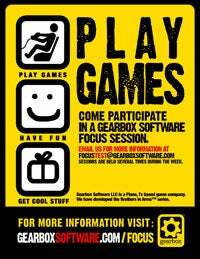 I am assuming that by mentioning those two specific titles, that those are the games you'll be honing, though a visit to a game studio is a visit to a game studio, so if you're over 18 and able to make it to Plano, Texas between the hours of 10am to 6pm, head on over to www.gearboxsoftware.com/focus to learn more. If you aren't in either case, move along - nothing to see here.